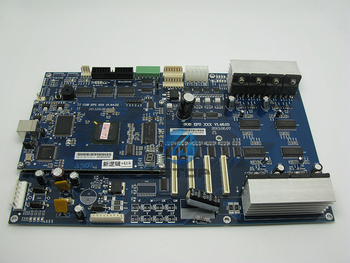 The main board of inkjet printer is an expensive accessory, which involves the daily maintenance of the whole machine. What should we pay attention to maintain it? There are several reasons for the inkjet printer to burn the main board. The main reason is that the circuit line connecting the nozzles is not connected to cause the motherboard to burn out. Or the voltage is too high and the stable voltage is not maintained at 220 voltage to cause it to burn out. The inkjet printer’s own power can not adjust the voltage to cause the machine to short the main board. The electrolyte inside the machine does not decomposition of some poor quality ink, causing the print head to burn out then causes the main board to burn out. What are the best solutions to avoid inkjet printer burning the main board? First, find a professional inkjet printer technology team to maintain the whole machine for us. Second, inkjet printer should be used to maintain a stable voltage. Third, choose good inks. So how do you choose good inks for your own use? 1. The acidity and alkalinity of inkjet printer inks, such as the metal parts of inkjet printers. They are exposed to inkand will be corroded. It is recommended to use neutral pH inkjet printer ink. 2. The fluidity of the ink is good or bad. Buy some trial ink in the airand one month to observe that if there are some serious particle problems, you can distinguish its fluidity. 3. The problem of the surface tension of the ink is also a factor. The better the fluidity of the ink, the smaller the tension of the ink, and the finer the printed lines. 4. Pay attention to save the sublimation ink: strictly control the indoor temperature and humidity, and the indoor temperature should be at least 18 °C. For the temperature of the southern users, the humidity in the room should be controlled. When the humidity is too high, the picture is not easy to dry, and the material is easily damp. It affects the printing effect and the post-processing of the picture.